Lunch. Sitting down for a leisurely lunch hour for an hour or so seems almost archaic these days. The University of Westminster says that the average person nowadays, takes a short fifteen minute lunch, usually in front of a computer. This is true for me, as someone in retail, lunch is something you gobble down while hiding in your office. 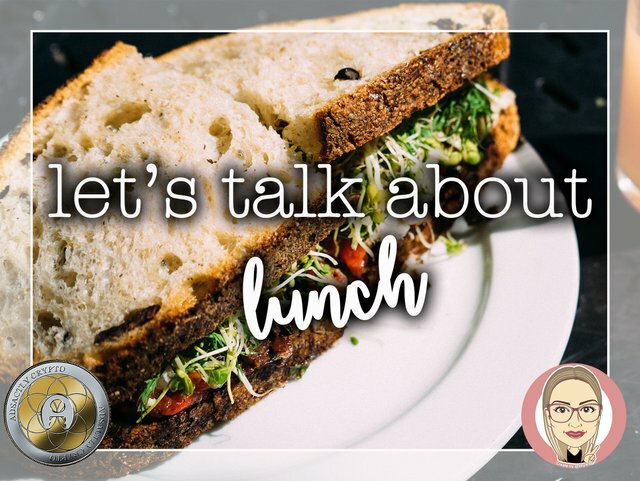 It was not always like this though, and today we will explore the history of lunch, and have a look at what people are eating all over the world for lunch. Most people would think that the origin of the word lunch is luncheon, but this is only partly true. In the 1500's nuncheon was a commonly used Anglo-Saxon term for a quick bite, that could be held in your hands. Nuch also meant bread, the most commonly eaten lunch time food. 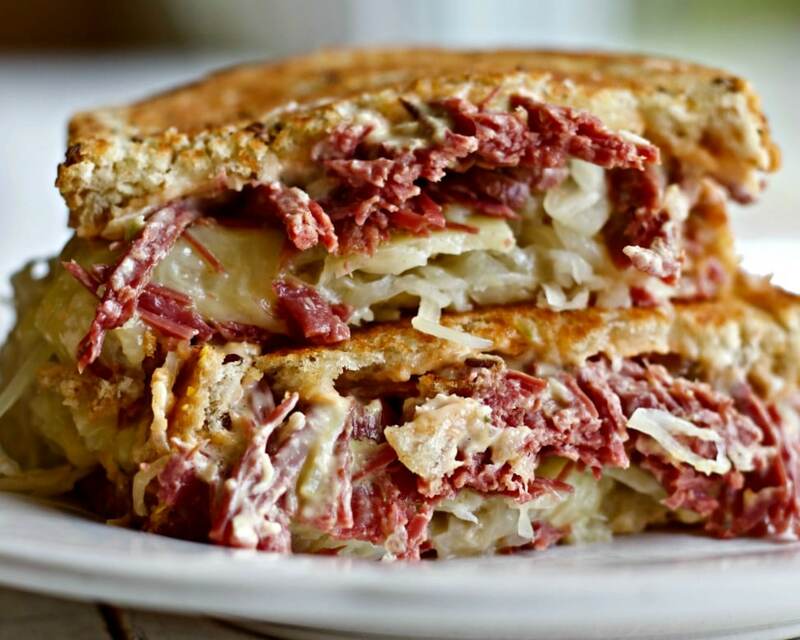 We can't talk about lunch without speaking of the humble sandwich. I'm sure you are all familiar with the story of the Earl of Sandwich, who, in the midst of an intense card game, asked for some cold meats between two slices of bread. And, thus, the most common lunch food was born. With the dawning of the Industrial Revolution, the working classes meal times were determined by working hours, and hundreds of country folk had moved to the cities and towns. 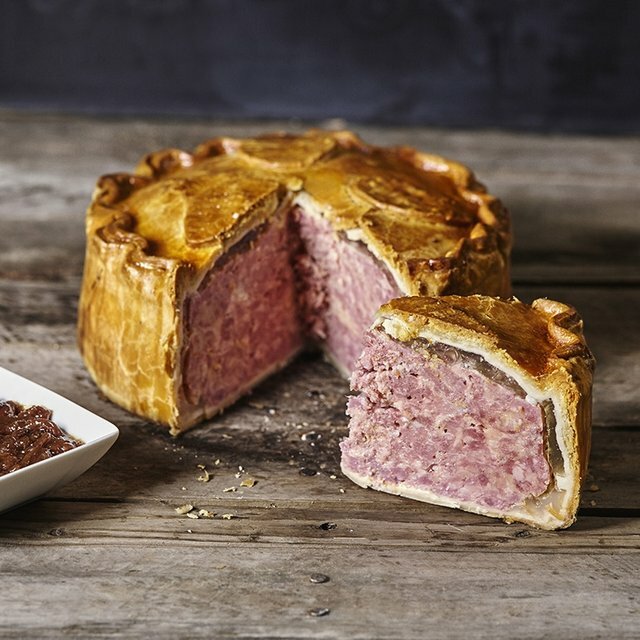 With no garden or place to grow their food, food stalls in the cities became commonplace, with items such as pies, sandwiches and soups sold on most corners. Post War time saw most people taking an hour's lunch, with it being made law in most industries. Fast forward to 2018, when lunch is usually a quick bite. Let's take a look at what people around the world are eating for lunch! In Korea, like Japan, many small dishes are served, sort of like a snack platter. 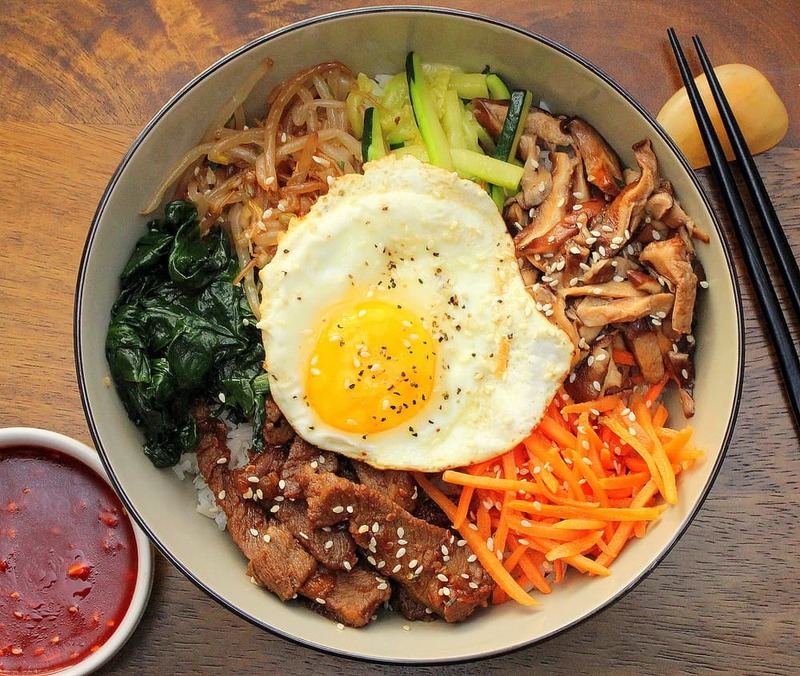 Short grain rice and kimchi are served at most meals, and Bibimbap is a common lunch dish, consisting of rice, sauteed veggies, beef strips, chilli paste and a fried egg. I have wanted to make this for ever, and definitely will try soon. Indonesia is renowned for its street food, and a commonly eaten lunch is Soto. A spicy chicken noodle dish with vermicelli noodles and an egg, it is known to be filling and inexpensive. 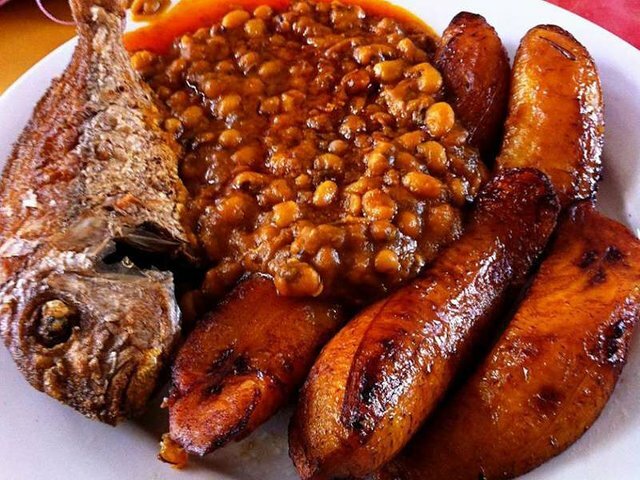 In Ghana a popular lunch is Red Red, also eaten in the Ivory Coast and Nigeria. It looks delicious! Basically, it is stewed beans, served with fried plantains and rice, and sometimes with some sort of fish. I love beans so much, and think this looks incredible! While not only eaten in Israel, the Falafel is a very popular choice for lunch for Israelis. So much so, that when the film Cloudy with a Chance of Meatballs was released, it's translated name was It's Raining Falafel Balls. LOL!!!! I chose Poland for our second European country, so I hope all our friends at Steem Fest will taste these dishes and tell me all about them! In Poland, a larger meal is eaten at lunch time, and at dinner, a sandwich or salad is eaten. So, lunch is often two courses; a soup, and a warm main course. I thought that the Chlodnik Litewski, a yoghurt and beet soup, served cold, looked stunning. 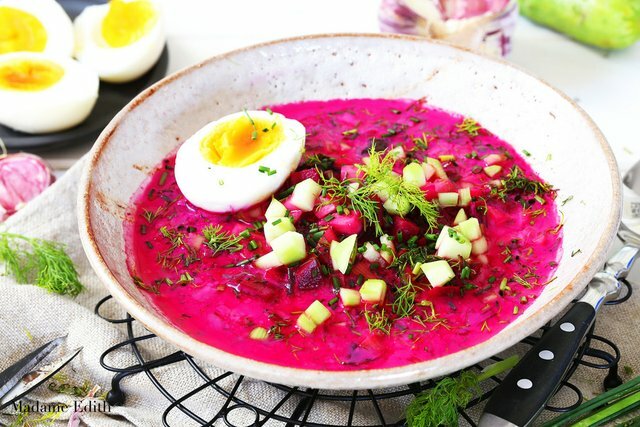 I love beetroot too, so if you have this at Steem Fest, tell me about it! The array of main courses I found that are popular in Poland for lunch look incredible, and I chose Golabki which are cabbage leaves stuffed with rice and meat. Looks tasty! Since America is such a huge and diverse country, I chose to focus on two states rather than countries today. In Hawaii, there are many diverse influences on their cuisine, including Japanese and Polynesian island palates. 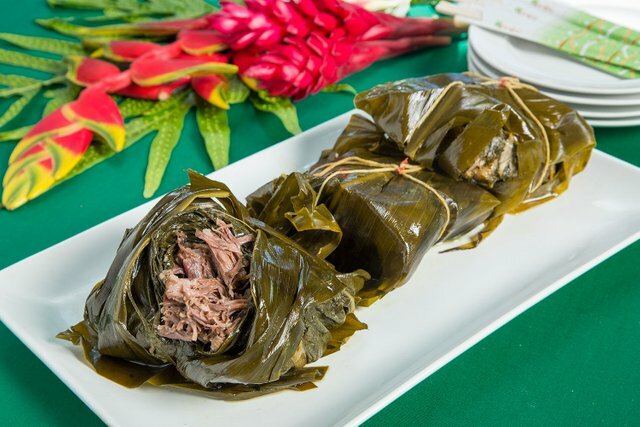 A popular lunch dish in Hawaii is Laulau, which is pork wrapped in taro leaves, and cooked over a fire, making for a smokey flavour. I hope you loved learning about all these dishes as much as I did. I'd love to hear what you eat for lunch in your country! Look out for the next instalment of this series, on DINNER. That's so delicious food. I like this types food. It's so tasty. Most of the teenagers like this types of food. Here , I see some sea fish , chamber of Oregon pie, it's so healthy. ah i have never heard of that, where are you from? I confess I love good food, good dishes, @princess! Thank God I also enjoy cooking. I love to invent, to be creative in the kitchen. I enjoy the smells, the flavors, the mixture of ingredients, so this series of posts have me fascinated. Lunch is perhaps one of the most important and sacred meals for me. This is the right time to meet as a family and to tell us about the things we have done in the day. Even though we have a lot of things to do at work, we are always looking for a way to dedicate some time to the encounter. I liked the fact that you went through the concept of lunch and its creation. 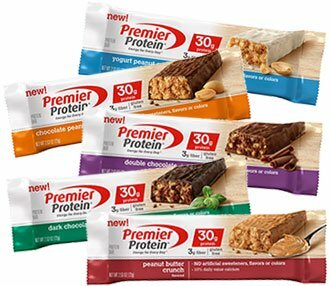 In my country, Venezuela, it is customary to eat one serving of protein with one serving of carbohydrates. Normally lunch is the most abundant meal of the day, so in a dish there can be a lot of rice with pieces of meat and fried bananas, or pasta with pieces of chicken and grains. The picture of the food from Africa can be that of one of the Venezuelan lunches or at least the lunches we had before the crisis. I look forward to the delivery of the dinners! Thank you for so nice posting for you and @adsactly. Glad you enjoyed, @nancybriti . I am also an inventor in the kitchen, it's fun! You are right, it is really important to have a meal together as a family, to sit down and enjoy each other's company. @morkrock and I do it often, just to catch up and chat and enjoy each other. From this part of Africa, Nigeria, where i am from we eat boiled yam and grinded pepper mixed into a palm oil. Others eat grinded rice fried with hot steam and little groundnut oil know as (Masa) with a pepper sauce or stew. Lunch is very important to me particularly, so i tend to eat something extra heavy and more of carbohydrate because its an energy giving food. So after a tedious work from morning till about the time of lunch one would have been tired and needs to replenish. I will agree with you that currently people spend more time on Tv, computer, and other things and as a result of that they do not eat their lunch at the exact time. Some eat lunch at a very late hour and other don't at all either because of work or one reason or the other. What ever we eat as lunch we must remember that having a balance diet is extremely important to our body build up. Because nutrients and vitamins are required to build lost tissues and replace the ones it can. Eating healthier meals is important. very true! I often skip lunch at work, and around 3pm, end up feeling so tired, and then I realise that I haven't eaten, then I have a snack, and feel much better! It's obvious that their is always something to learn everyday, like they said learning never stops until you give up. So what do we have here, first was breakfast, it's origination and some breakfast meals in different countries and now it's lunch. Would I have known about it's origination without you. Well I hardly partake in lunch due to my nature of job but when I'm likely free to have lunch, I normally do that with fried yam and beans with some oil on it. Thanks alot this message @princessmewmew. Looking forward to your next post which I guess it'll be dinner. It seems that in Nigeria a lot of beans are eaten. I just love beans, they are so tasty and filling. Glad you enjoyed, and yes, dinner is next! I love food! @princessmewmew! You introduced so many delicious and mouthwatering foods to me. In my country people used to take meals only twice a day. They used to take heavy breakfast come lunch around 10-11 am and then around 6-8pm they usually took dinner. It was the usual course of the rural people. In some parts where agriculture is the main occupation, such food timings still present. After the industrialization, people engaged in services. Now, even the rural people are taking three times meal during a day. This shows how our food habits depends on our occupations. I could totally go for some falafel right now! :) And if you get a chance to try Golabki, go for it! Especially if it is homemade. My Polish BF's mom even makes me vegan versions stuffed with rice and beans so I can still enjoy it. yes, I lovvve falafel so much! I also do a lot of home cooking, from scratch and am surprised at the amount of take out and frozen meals people eat. I just can't! I love cooking, so I don't mind planning my meals and making sure there is something yummy and nutritious to eat. Again enjoying your tasty gastronomic posts, @princessmewmew. Almost having lunch with this one. As it usually is, very good verbal and graphic information. Appetizing dishes seasoned with eloquent photographs. Of the ones that you show, the ones that attract me the most are the African Rojo Rojo (it looks like a certain combination very usual in Venezuela), the meatloaf from the United Kingdom and the *Golabki. In my country, there are very traditional lunches; in addition to the "sancocho" of fish (which I referred to in a previous comment), this is a thick soup made with the belly of beef which here is called "Mondongo", and contains different tubers (especially those with a sweet taste), banana, some fruits which here are called "quimbombó" and "gherkins" (they are round), with the base of a stew of onion, garlic, chili and other spices such as oregano. Greetings to you and @adsactly's friends for spreading your post. mmm, your descriptions sound so good! that mondongo sounds very tasty 😎thanks for your ovely comment! Interesting what the world eats at lunch! I'm in America but I loved the Asian lunch but have never tried Kimchi. After morning light breakfast (fruits), heavy food should be eaten at noon. Heavy food should be eaten in a healthy diet. It is not good to eat oil or fast food during the time of after noon. Your previous post had morning meal and now lunch. Both were very good. I know, you guys eat a lot of rice! Do you ever get tired of it? My family doesn’t but I get tired of it. I just cook a steak or have some lasagne here and there. Too much carbs is bad for you if your not burning it all. Se ve deliciosa esa comida. Saludos. Healthy food is also needed for survival such as food needs. That's why you should eat regular and listed foods. Otherwise, there is the possibility of getting sick. So we should eat lunch and avoid harmful food for body. The food you said at lunch is very useful for us. Thank you dear for your importance suggestion. In reality this is more like lunch in America. If I could have a sandwich like the one that you showed I would be thrilled. oh no man! that's a sad lunch! You received more than 460000 upvotes. Your next target is to reach 470000 upvotes. thanks for giving more information in one page! Excellent well researched post @princessmewmew, fascinating how cuisines vary all over the world. But obviously it's because of available produce not so!